De ria's en havens van Galicië in Noord-West Spanje. Van Ribadeo tot A Guarda en de grens met Portugal. 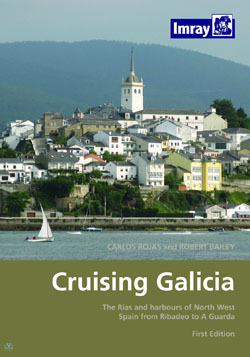 This new title covers the extensive cruising area of Galicia in the north west of Spain from Ribadeo to Bayona, where the beautiful rías provide shelter from the Atlantic in picturesque harbours and remote anchorages. The authors have spent several seasons cruising in the area and making use of their local connections have produced a modern guide that provides in-depth information necessary for yachts spending time visiting the rias and ports of Galicia. Annotated town plans covering over 90 destinations show shore-side facilities and recommended restaurants and side panels provide advice on interesting places to visit, local customs and features of interest. Carlos Rojas has sailed yachts since 2000, a short but intensive career during which he has crossed the Atlantic, cruised in the Pacific, made several passages across Biscay and sailed to Ireland and France. His professional involvement in technology companies as an engineer, manager and director has given him an insight into design and usability that he applies to his pilot books. Carlos has lived most of his life in Britain but he is originally from Spain, a country that he knows well, naming Galicia as one of his favourite areas. Robert Bailey was brought up in a sailing family. Over a period of 35 years, and with the aid of a Nicholson 32 and Rustler 36, much of the coastline of the north western approaches to Europe, from the Faroe Islands in the north to the Morbihan in the south, were avidly explored. In 2001 he adopted a more flexible approach to his career as an aerospace engineer and this allowed him to take up cruising instruction. He is now a Yachtmaster Instructor.